The associations between the immatures of Anopheles gambiae s.s. (Diptera: Culicidae), its M and S forms, and Anopheles arabiensis among and within larval breeding habitats in Banambani, Mali were investigated under varying conditions of water quality and rainfall. The intent was to elucidate on niche partitioning of these taxa. Immatures of An. arabiensis, An. gambiae s.s., and its M and S forms were sampled every alternate day for a month in mid-rainy season from three sampling sites in each of the larval breeding habitats (rock pools, swamp, and puddles). Water quality was characterized by alkalinity, conductivity, dissolved oxygen (D.O. ), nitrate, orthophosphate, pH, temperature, total dissolved solids (TDS), and turbidity. A type 3 analysis of the GENMOD model was used to examine the associations between the proportional frequencies of young (first and second instar larvae) and old (third and fourth instar larvae and pupae) or total immatures of species or forms among sampling sites within and among larval breeding habitats during a category of rainfall as influenced by water quality. Of the 4,174 immatures sampled, 1,300 were molecularly identified to species and forms. Significant association between the proportional frequencies of young larvae of An. arabiensis, An. gambiae s.s., its M and S forms was found among sampling sites within habitats but not among larval breeding habitats. The proportional frequencies of young larvae of M and S forms varied daily perhaps due to recruitment, mortality, and dispersal within habitats. Conductivity and TDS had significant effects when the proportional frequencies of young larvae of M and S forms among sampling sites within habitats were significantly associated. Alkalinity, D.O., orthophosphate, pH, nitrate, temperature and turbidity had no effects on niche partitioning of species and forms among sampling sites within habitats. Rainfall did not affect the frequencies of these immatures. Conductivity and TDS have significant effects on niche partitioning of young larvae of M and S forms among sampling sites within habitats in Banambani, Mali. The genetic structure of the Anopheles gambiae s.l. complex is thought to have enabled members of this complex species to occupy different habitats [1–5]. The two principal vectors of malaria in this group, An. gambiae s.s. and Anopheles. arabiensis, are broadly sympatric but there are areas where only one or the other may be found . Macrogeographic studies of habitat usage across sub-Saharan Africa generally find that An. gambiae s.s. and An. arabiensis differ principally along axes of warm-cool and dry-wet, though there is more to differences than just climate [7–11]. Less is known about macrogeographic differences across sub-Saharan Africa in habitat usage among chromosomal or molecular forms of An. gambiae s.s. though Touré et al. reported that they exist. The S form is distributed from 13°W to 50°E and is the only form recorded mainly in the east of Great Rift Valley, whereas the M form seemingly shows a greater distribution from 16°N to 16°S and is the only form found in savannah areas of northern Senegal and in the desert borders of southern Angola . In west Africa, the M form seems able to exploit man-made habitats that are otherwise available only to An. arabiensis in dry areas . Much less is known about microgeographic differences in habitat usage by An. arabiensis, An. gambiae s.s., and its M and S forms. The location of larvae in a habitat is due to selection of oviposition site by gravid females, and numbers available for sampling depend upon larval dispersal and survival. In Mali, An. gambiae s.s. and An. arabiensis often coexist together, and each occupies a variety of habitats. Charlwood and Edoh  observed differences between the larval distribution of An. gambiae s.s. and An. arabiensis based on distance from adult feeding sources in Tanzania. Minakawa et al. observed that the distance to the nearest house and types of soil substrate were significantly associated with the relative larval abundance of An. gambiae in Kenya, but were unable to detect any significant association between their occurrence and larval habitat variables. Gimnig et al. reported that An. gambiae s.l. was associated with turbid water, algae, the absence of emergent vegetation, and small habitats. In laboratory studies, McCrae  observed that An. gambiae s.l. laid more eggs in petri dishes with turbid water from a natural site than in distilled or tap water. Gimnig et al. found that adequate food such as algae, bacterial composition and nitrogen were important regulators of larval growth of An. gambiae. These studies were directed at understanding species-level differences in habitat usage within the An. gambiae complex, and did not attempt to distinguish the habitat usage of the chromosomal or molecular forms within An. gambiae s.s. In an earlier study , habitat differences between species (An. arabiensis vs. An. gambiae s.s.) and between molecular forms (M vs. S) of An. gambiae s.s. were explored in Banambani, Mali. Differences were greater between species than between the M and S forms among the larval breeding habitats (rock pools, the swamp, and puddles). The larval abundance of An. gambiae s.s. and An. arabiensis differed significantly among habitats. Differences between the immatures of the M and S forms were found among habitats in Banambani, Mali in 1999 when rainfall was high, but not during the two drier sampling periods in 1997–1998. In Burkina Faso, the M form larvae occurred at a higher relative frequency than the S form in man-made or more permanent habitats (e.g. irrigated areas), whereas the S form larvae were more prevalent than the M form in more natural sites (e.g. rain-dependent pools) [5, 13, 18, 19]. Spatial segregation between the M and S forms was not influenced by their differences in exploiting the physicochemical conditions of their larval breeding sites . Ayala and Coluzzi  predict that there must be specialization of the different forms to separate niches prior to complete reproductive isolation. In the current study, the strength of associations between the proportional frequencies of the immatures of An. arabiensis and An. gambiae s.s., or its M and S forms among the larval breeding habitats (rock pools, the swamp, and puddles), or among sampling sites within a habitat in Banambani, Mali was examined under varying conditions of water quality, and rainfall during a mid-rainy season. The strength of associations between the young (first and second instar larvae) and old (third and fourth instar larvae and pupae) or total immatures of either species or forms within and among habitats was also determined as influenced by each of the physicochemical variables of water. This was motivated, in part, by differential mortality among life stages of An. gambiae s.l. in different aquatic habitats . The intent was to shed further light on ecological niche partitioning that had been observed earlier. Banambani village, the study site, is about 20 km northeast of Bamako, in the Northern Sudan Savanna of Mali, West Africa (12° 48' N and 8° 03' W). For a more detailed description and pictures, see Edillo et al. [17, 23]; Touré et al. [12, 24]; Touré . An updated map of Banambani village, indicating locations of the larval breeding habitats and sampling sites within each habitat, is shown in Figure 1. Larval breeding habitats around Banambani have been monitored since 1997 [17, 23]. For this study, three sampling sites were established within each habitat for regular collection of immatures and monitoring of water quality. The fieldwork was conducted during the rainy season, 28 July – 25 August, 2000. The weather data during this period were: 237.2 mm of total rainfall in 15.8 h and 27.3°C ± 0.65 mean monthly temperature ± S.E. An updated map of Banambani village, Mali during the rainy season of 2000. 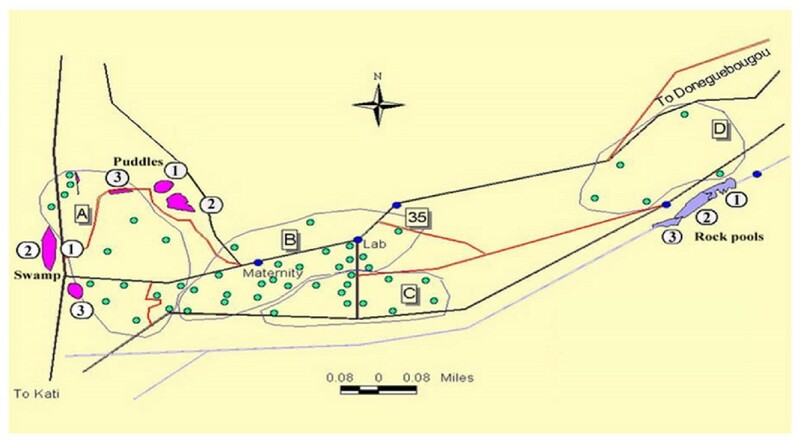 Encircled numbers are the three sampling sites in each of the larval breeding habitats (rock pools, swamp, and puddles). Shaded circles are the compounds where villagers live in huts. Larvae and pupae of An. gambiae s.l. were sampled every alternate day from 28 July to 25 August, 2000 whenever weather permitted. A sampling consisted of 60 dips (350 ml) made using a standard aquatic larval dipper from near the edges of each sampling site within each habitat. Immatures were stored in plastic bags containing water from the sampling site and brought to the laboratory in Bamako on the same day they were collected, where they were individually placed dry into 1.5-ml microcentrifuge tubes and were stored at -80°C until processed for DNA extraction. An. gambiae s.s. was distinguished from An. arabiensis by the polymerase chain reaction-based diagnostic of Scott et al. . Larvae and pupae samples were randomly chosen from each sampling site within each habitat on each sampling day. DNA was extracted following a procedure modified from that of Lanzaro et al. and described in Edillo et al. . DNA templates were amplified with primers specific for each sibling species as described by Scott et al. . Aliquots of randomly selected individuals identified as An. gambiae s.s. were used to separate M from S molecular forms following the PCR-based diagnostic of Favia et al. . The physicochemical properties of water samples from which immatures of An. gambiae s.l. were sampled from the edge of each sampling site within each habitat were measured between 0900–1200 h with a LaMotte water chemistry kit (LaMotte Company, Chestertown, MD) following procedures described in The Monitor's Handbook . Measurements of conductivity, dissolved oxygen (D.O. ), nitrate (NO3), orthophosphate, pH, total alkalinity, total dissolved solids (TDS), turbidity, and water surface temperature are described in Edillo et al. . Concentrations of D.O. (ppm), nitrate (ppm), orthophosphate (ppm), and total alkalinity (ppm) were measured weekly; turbidity expressed in Joules turbidity unit (JTU) was monitored biweekly; conductivity (μmhos/cm) and TDS (ppm) were determined every other sampling day during the second and fourth week of the fieldwork. Water temperatures (°C) and pH at the edge of each sampling site were determined at each sampling day. The mean ± S.E. of all repeated measurements of each physicochemical property of water in each larval breeding habitat or sampling sites within each habitat were calculated. Prior studies had indicated that rainfall seems to be a critical feature of habitat differences, especially between the molecular forms of An. gambiae s.s. . Heavy rainfalls over a short period may create new pools and flush larvae out of some sites, moderate rains distributed over the wet season probably prolong the life of temporary pools and facilitate more eggs and larvae to mature . Thus, the count data of mosquito immatures were divided into three categories of rainfall : 1) samples collected one day after a heavy rainfall, 2) after a moderate rainfall, and 3) no rain for at least two days. The count data for species (An. gambiae s.s. vs. An. arabiensis) and forms of An. gambiae s.s. (M vs. S) were divided into three groups: 1) young larvae made up of first and second instar larvae, 2) old immatures composed of third and fourth instar larvae and pupae, and 3) total immatures. The strength of association between the species or forms (the response) and larval breeding habitats or sampling sites within a habitat in each day's sampling and during a category of rainfall (the predictors) was examined by repeated measures logit model using a type 3 analysis of the GENMOD procedure [31, 32]. This test computes the likelihood ratio statistics for the overall main effects of predictors on the proportional frequencies of these groups of immatures, and ensures that results do not depend on the order specified in the model. The model does not treat the absence or presence of either species or forms. However, it calculates the ratio of events/trials, where event is the response of interest (e.g., number of young vs. old immatures of An. gambiae s.s. and An. arabiensis, or of the M and S forms), and trials is the total number of possible events (e.g., total number of young and old immatures of species, or of forms). Because the data are nested (i.e., in each of the 14 collection days, there are data from three sites in each of the three habitats), covariance-variance structure in the repeated statement of the model is incorporated to correct for potential problem of correlated data points. The strength of association between each physicochemical property of water, to avoid multicollinearity, and the proportional frequencies of An. gambiae s.s. and An. 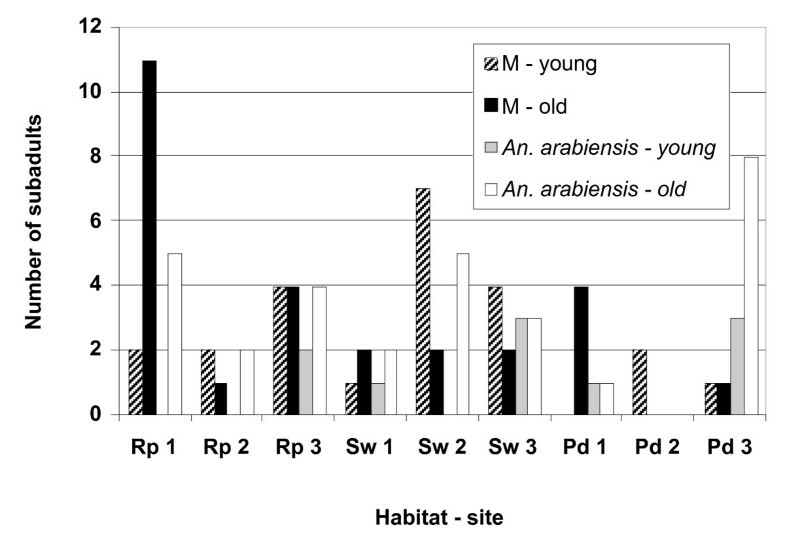 arabiensis, or the M and S forms (young, old and total immatures) among larval breeding habitats and sampling sites within a habitat, and during a category of rainfall was further examined by using the above model. For analyses that showed insignificant effect of a physicochemical property of water but had significant association between the proportional frequencies of species or forms among sampling sites within habitats but not among larval breeding habitats, the GENMOD model was modified by eliminating the habitat effect. The mean physicochemical characteristics of water among the sampling sites within each habitat are shown in Table 1. Turbidity varied significantly among sampling sites within each habitat (F = 12.82, df = 2, P < 0.01) but not among larval breeding habitats (F = 1.71, df = 2, P > 0.05). Water was relatively turbid (265 ± 65 JTU) among sampling sites in the swamp, and clear or slightly turbid (30 ± 5 JTU) in rock pools. The three puddle sites varied in their turbidity from clear (20 ± 5 JTU) to turbid (105 ± 5 JTU) or very turbid (330 ± 30 JTU). Conductivity and TDS varied among the three puddle sites and among two sampling sites in the swamp and rock pools. Immatures were collected in water with pH values ranging from slightly acidic to basic (Table 1). All puddles, rock pools, and sampling site 3 of the swamp were exposed to the sun, whereas sampling sites 1 and 2 of the swamp were partly shaded by surrounding trees. Overall, 1,300 of the 4,174 An. gambiae s.l. immatures collected were randomly selected from each sampling site in each sampling day within a habitat and processed for species identification by PCR. Of these, 960 (74 %) samples were identified (351 in rock pools, 297 in the swamp, and 312 in puddles); 340 (26 %) specimens could not be diagnosed because of poor DNA samples. The 920 immatures identified were further processed as An. gambiae s.s. for M and S forms. Immatures of An. gambiae s.s. were more numerous than An. arabiensis among all sampling sites in rock pools, the swamp and puddles where they were sympatric (Figures 2, 3). The strength of association between the species and the larval breeding habitats or sampling sites within a habitat was examined by using a type 3 analysis of the GENMOD model. This model incorporates a covariance-variance structure and calculates the association between the proportional frequencies of either An. gambiae s.s. and An. arabiensis (young and old or total immatures) among larval breeding habitats, and sampling sites within a habitat in each day's sampling and during a category of rainfall. Significant association was found between the proportional frequencies of young larvae of An. gambiae s.s. and An. arabiensis among sampling sites within each habitat (P < 0.05) but not among larval breeding habitats (P > 0.05)(Table 2). Old and total immatures of either species were similar in their proportional frequencies (P > 0.05) among rock pools, swamp, and puddles. Rainfall and day's sampling did not affect the relative frequencies of these immatures (P > 0.05). Distribution of the M forms and An. arabiensis (young and old immatures) sampled from three sampling sites in rock pools (Rp), swamp (Sw), and puddles (Pd) in Banambani village, Mali. 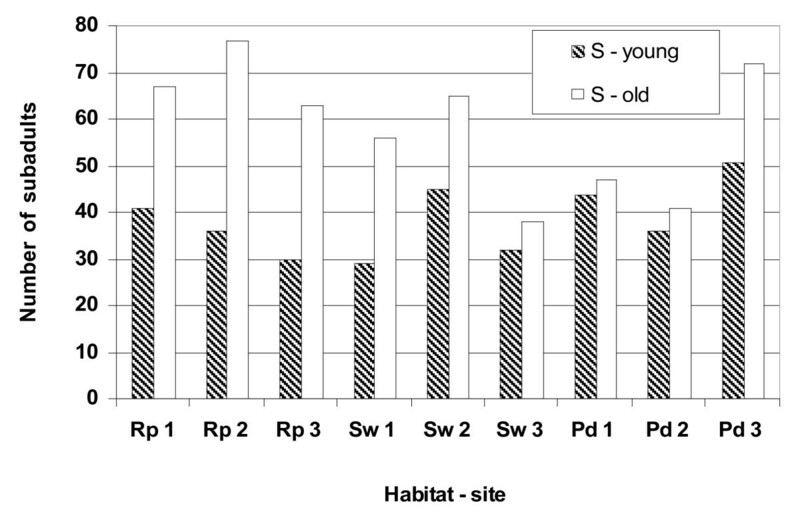 Distribution of the S forms (young and old immatures) sampled from three sampling sites in rock pools (Rp), swamp (Sw), and puddles (Pd) in Banambani village, Mali. S form immatures were more abundant than the M forms among habitats during the rainy season (Figures 2, 3). Both the M and S forms were most abundant in rock pools. The M forms were least abundant in puddles; the S forms, in the swamp. Analyzing the data as above, significant association was found between the proportional frequencies of young larvae of the M and S forms among sampling sites within a habitat (P < 0.05) but not among larval breeding habitats (P > 0.05)(Table 3). The proportional frequencies of the total immatures of the M and S forms among habitats had a borderline significance (P = 0.05), indicating that they were similar there. The proportional frequencies of young larvae of the M and S forms varied daily (P < 0.05), perhaps due to intermittent recruitment combined with high mortality and dispersal within habitats; old immatures were relatively constant (P > 0.05). Overall, rainfall did not affect (P > 0.05) the proportional frequencies of the immatures of the M and S forms. The strength of association between each of the nine physicochemical properties of water and the proportional frequencies of An. gambiae s.s. and An. arabiensis among the larval breeding habitats or sampling sites within each habitat during a category of rainfall was examined separately by using the same model as described above (Table 4). Significant χ2 value (P < 0.05) was observed between the young larvae of An. gambiae s.s. and An. arabiensis and sampling sites within habitats but not among larval breeding habitats when conductivity, orthophosphate, pH and TDS had no significant effects (P > 0.05). The strength of association between each of these four physicochemical properties of water and proportional frequencies of species among sampling sites within each habitat was further examined by using a modified GENMOD model by eliminating the habitat effect (Table 6). Consequently, no significant effects of conductivity, orthophosphate, pH and TDS (P > 0.05) were observed when young larvae of An. gambiae s.s. and An. arabiensis (P < 0.05) were significantly associated among sampling sites within each of the larval breeding habitats. This suggested that chance or seemingly other external factors, unique in each site, influenced their association. The old immatures of An. gambiae s.s. and An. arabiensis appeared very tolerant to the temporal changes of all physicochemical variables measured (P > 0.05) (Table 4). Significant association between the proportional frequencies of the total An. gambiae s.s. and An. arabiensis among sampling sites within habitats (P = 0.049) was found when conductivity had no significant effect (P > 0.05). Further analysis (Table 6) revealed that conductivity had no significant effect on the proportional frequencies of these sibling species among sampling sites within habitats, and that chance or seemingly other external factors, unique in each site, influenced their relative frequencies. Overall, rainfall did not have any effect (P > 0.05). Analyzing the data as above (Table 5), significant association between the proportional frequencies of young larvae of the M and S forms of An. gambiae s.s. among sampling sites within each habitat (P < 0.05) but not among larval breeding habitats (P > 0.05) was observed when alkalinity, conductivity, D.O., temperature, and TDS had no significant effects. The strength of association between each of these five physicochemical properties of water and proportional frequencies of molecular forms among sampling sites within each habitat was further examined by eliminating the habitat effect in the GENMOD model as described above (Table 7). Interestingly, conductivity and TDS had significant effects (P < 0.05) when the proportional frequencies of young larvae of the M and S forms among sampling sites within habitats were significantly associated (P < 0.05). Older larvae and pupae of the M and S forms appeared more resilient to most of the water properties (P > 0.05) except for pH. A significant association was observed between the proportional frequencies of old immatures of the M and S forms among sampling sites within habitats (P < 0.04) when pH had no significant effect (P > 0.05) (Tables 5, 7). A combination of factors may have contributed to the relative frequency patterns of the immatures of An. gambiae s.s., its M and S forms, and An. arabiensis observed at Banambani village, Mali: 1) water quality within habitats in the presence of seemingly other external factors, 2) oviposition patterns, and 3) differential survivorship among species and forms. Water quality and other factors. Conductivity and TDS have significant effects when the proportional frequencies of young larvae of the M and S forms among sampling sites within habitats in Banambani are significantly associated (Table 7). Conductivity is a measure of the inorganic materials and ions in water, whereas TDS are the sum of all dissolved (organic or inorganic) and suspended solids in water . As TDS increase, conductivity also increases. Pollution from irrigation, along with materials related to flooding after heavy rains, influence conductivity and TDS, and may have restricted larval population to sites within habitats that have tolerable ecological regimens. Reisen et al. find that high conductivity may have altered the age structure of Culex tarsalis in Kern County, California. Alkalinity, D.O., orthophosphate, pH, nitrate, temperature and turbidity have no effects on niche partitioning of the immatures of An. gambiae s.s., its M and S forms, and An. arabiensis because these physicochemical properties, except turbidity, are mainly similar among sampling sites within habitats (Table 1). Sagnon et al. do not also detect strong associations between the species or molecular forms and any physicochemical variables of water, except conductivity, in Burkina Faso. Despite the insignificant effects of these physicochemical properties of water on mosquito immatures, significant association is found between the proportional frequencies of young larvae of An. arabiensis, An. gambiae s.s. and its M and S forms among sampling sites within habitats but not among larval breeding habitats. Thus, water properties influence growth rates of larvae, although other unmeasured factors may also be important. It is speculated that the M and S forms contrast significantly in their way of exploiting limiting resources in their habitats [5, 18]. This is not shown in the current study and is consistent with Diabate et al. , although it is possible that the forms differ in utilizing limiting resources along with other variables that are not measured. Candidate correlates include bacterial composition , chlorophyll , detritus , and maize pollen (Zea mays)[38, 39] which are also sources of food for the larvae. Ye-Ebiyo et al. observe that An. arabiensis larvae readily ingest wind-borne maize pollens that are nutritious enough to support their development. In Banambani, there are several maize plants near rock pools, thus pollens can be dispersed by the wind within the village because every maize plant can produce 14–50 million grains  and around 500 thousand pollen grains may remain airborne ≥ 60 m from maize plants that produce ~25 million grains . These are interesting topics to be investigated for members of An. gambiae s.l. in Mali. Oviposition patterns. Significant association between the young larvae of An. gambiae s.s., its M and S forms, and An. arabiensis and sampling sites in each of the larval breeding habitats supports the hypothesis that oviposition patterns and behavior of An. gambiae s.l. may have influenced microhabitat colonization [5, 9]. It also suggests differential selection of oviposition sites within habitats by adult females of An. gambiae s.s. and An. arabiensis. Significant daily variation in the relative frequencies of young larvae of the M and S forms seems to reflect changes in the oviposition behavior of An. gambiae s.s. Alternatively, the microbial fauna in larval breeding habitats of An. gambiae s.l. probably release volatiles that may be used as oviposition cues or deterrents . Aedes and Culex mosquitoes exhibit a differential response to oviposition media based on the composition of microbial species [42–44]. This is an interesting area for future investigation for members of An. gambiae s.l. Coluzzi  and Powell et al. have emphasized the importance of historical changes in human-mosquito associations. It appears difficult to determine the association of species and forms based on distance to houses where adult females have their blood meal host or resting shelter in the village, because there are no differences in their frequencies among habitats. Previous mark-release-recapture (MRR) experiments revealed insignificant association between species and forms of female adult mosquitoes and larval abundance in the habitats adjoining them in 1997 and 1998 mid-rainy seasons in Banambani . This was consistent with the MRR study in the village in 1993–1994 . Costantini et al. reported occasional intervillage exchange of adult An. gambiae s.l. after heavy rains in Ouagadougou, Burkina Faso; Touré et al. surmised that the same would be true of Banambani, and in fact some were observed by Taylor et al. . Differential survivorship among species and forms. Daily variation on the proportional frequency of young larvae of the M and S forms implies differential survivorship among life stages of immatures among larval breeding habitats in Banambani. Reisen et al. also observe unequal effects of mortality factors among life stages of Anopheles culicifacies that contribute to their disproportionate distribution in Pakistan. Mortality of An. gambiae s.l. immatures in Kenya occurs mainly among third and fourth instars in marshes, and pupal mortality is relatively high in temporary pools . Although, survivorship estimates of An. gambiae s.l. are found similar among the larval breeding habitats in Banambani , emergence rate of the S form is higher than that of the M form in puddles and quarries . Conductivity and TDS have significant effects when the proportional frequencies of young larvae of the M and S forms among sampling sites within each type of larval breeding habitats (rock pools, the swamp and puddles) in Banambani, Mali are significantly associated. Alkalinity, D.O., orthophosphate, pH, nitrate, temperature, and turbidity have no differential effects on niche partitioning of the immatures of An. gambiae s.s., its M and S forms, and An. arabiensis because these physicochemical properties, except turbidity, are mainly similar among sampling sites within and among larval breeding habitats. It may be that the distribution of these mosquito immatures reflects adaptive differences of adult females, their oviposition patterns, differential survivorship of immatures, and the influence of water quality among sampling sites within habitats in the presence of some other environmental factors. These include bacterial composition, chlorophyll, detritus, and maize pollens that need to be further investigated. We thank A. Dao, B. Sissoko, I. Niaré, the late F. Niaré for their assistance in larval sampling, and L. Niaré for her accommodation in Banambani village. We are also grateful to W. Reisen for reading this paper, to the reviewers for their helpful comments, to X. Chen of UCLA ATS Statistical Consulting Group for her help in the GENMOD model, and to R. Sakai and R.W. Gwadz for technical support. This project was supported by grants from the National Institutes of Health (ROI AIS1633 and OOS522-03), the John Sealy Memorial Endowment Fund, WHO/TDR partnership, UCLA Graduate Division and International Studies Overseas Program (ISOP) and Fulbright grant to F.E.E. FE conceived the design of the study, carried out the field and molecular work, performed all data analyses, and wrote the manuscript. FT initially helped the PCR-based diagnostic in identifying the M and S forms, and critiqued the manuscript. YT critiqued the manuscript and together with GD facilitated in the coordination of field work and DNA extractions that were done in Mali. GL provided the laboratory facilities and reagents for all molecular work. CT participated in the design of the study, coordination of collaborators, and helped to revise the manuscript. All authors read and approved the final manuscript.